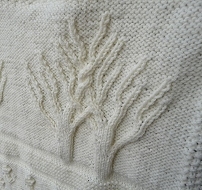 Finally, I have a final version of my version of the Baby Tree of Life Throw. My written version has been done for a while, but I had to quadruple check it! 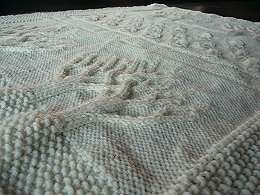 Oh and I knit another blanket then quadruple checked it again. Then I tweaked it a bit more; I think it is easy to read now. Then again after knitting 4 of these I know the pattern well. 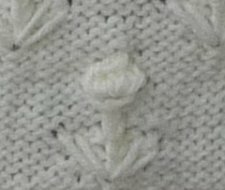 The basic changes I made are: a seed stitch border, shorter leaves, a couple rows of st st above the tree/flower pattern, extra garter st rows for the dividing patter, reworked dividing pattern so there are more knit rows than purl rows, instructions incorporate the 4 sts between the tree repeats, slip stitch edging (chain edge). And a few other tweaks here and there. 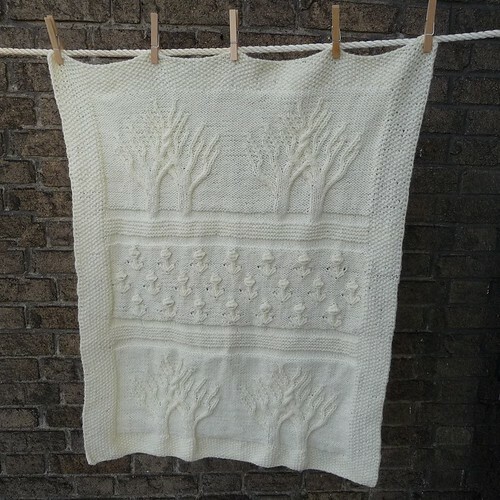 You can view and print my version of the Baby Tree of Life Throw in PDF.